Under the backstop, the UK will stay in customs union with the EU. Northern Ireland will maintain alignment with EU’s single-market rules. Mrs. May requests a 1 year time-table for the backstop, but the EU did not grant her request. The EU leaders clarified that they don’t intend to use the backstop and it will be only temporary. Even worse, EU leaders removed two important references in the Brexit draft. The first reference removed is that the backstop is not being desired and the second is they are ready to offer assistance to Mrs. May to ratify the deal in Parliament. Time is running short as the Brexit is due on March 29th. The ultimate deadline for the vote is January 21st. The news of the delay caused the pound to tumble to its lowest level in 18 months. The European Commission will publish plan to cope a no-deal Brexit this week. Even as both sides want to avoid this outcome, the possibility of a no-deal Brexit continues to linger and put pressure on Poundsterling in the near term. 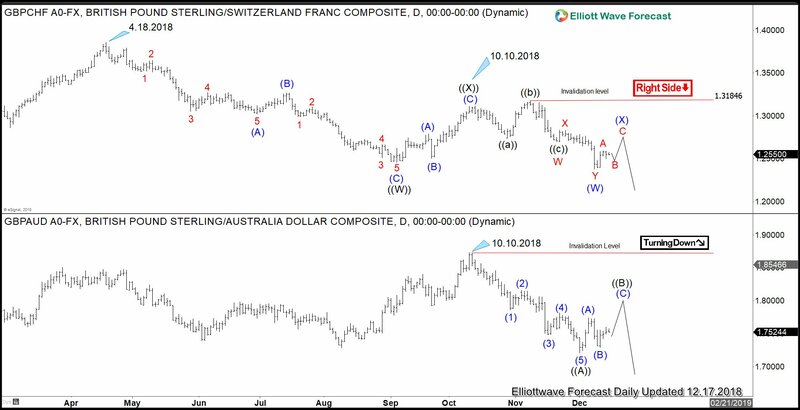 Elliott Wave Analysis on GBPCHF above suggests that pair has a bearish sequence (lower low sequence) from 4.18.2018 high, favoring further downside. Decline from 4.18.2018 high is unfolding as a double three Elliott Wave structure where wave ((W)) ended at 1.2459 and wave ((X)) ended at 1.3116 on 10.10.2018. Pair has since broken below wave ((W)) at 1.2459, suggesting wave ((Y)) lower has started. Near term, while bounces stay below 1.3184, expect pair to extend lower. An overlay of GBPCHF and GBPAUD reveal the same oscillation despite the different cycle. As we expect GBPCHF rally to hold below 10.10.2018 high and extends lower, the rally in GBPAUD should also hold the same pivot at 10.10.2018 high (1.3115) and extends lower. Decline in GBPAUD from 10.10.2018 is unfolding as a 5 waves impulse structure ending with wave ((A)) at 1.2675. Thus, while wave ((B)) bounce fails below 1.3115, expect pair to extend lower. Please keep in mind that market is dynamic and it may have changed from the time of this article.